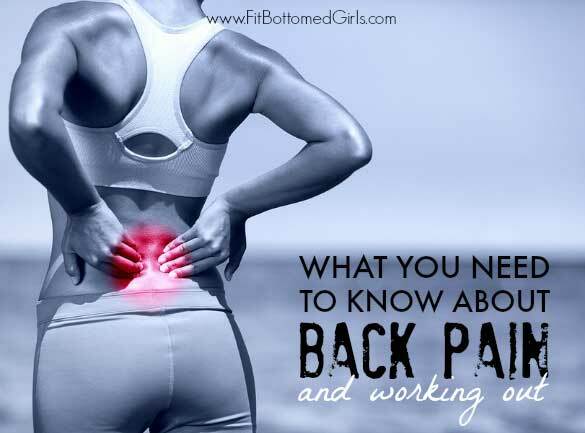 There’s nothing like a little back pain to throw a total wrench into your workout plan. And I don’t know how many times I’ve heard people forgo different exercises because they don’t want to “throw their back out.” While people suffer from and talk about back pain a lot, there doesn’t seem to be a lot of practical, actionable and easy-to-understand advice out there. So when Certified Rolfer and creator of 5 Secrets to a Flexible & Pain Free Body Sukie Baxter offered to give us a few tips on how active women can prevent and properly deal with an aching back (re: without painkillers! ), we were game. Read on for the 411 on working out and back pain! You’re working out. You’ve joined a gym, started a dance class, taken up with a running group and discovered that you like it. You really, really like it! You’re right in the middle of admiring your shapely curves in the mirror and enjoying that extra energy spark you get from upping your heart rate every day when wham! It strikes…that sharp, debilitating pain in your hip and lower back. Back and sciatic nerve pain will wipe out your workouts—and fast. It’s impossible to enjoy a pleasant jog around the neighborhood when even the slightest movement makes you grit your teeth in agony. But the alternative—being stuck on the couch and waiting for the pain to disappear—is almost less appealing. The good news is that back pain is rarely serious. While in some cases it can be a result of traumatic injury, like in the case of an auto accident or a bad fall, it’s much more common that back pain results from imbalanced muscle patterns that wear your body down over time. Because we’re born and bred in artificial environments with all the accoutrements of modern living like cushy couches and computer desks, just about everyone has a mix of muscles that are a lot tighter than they should be coupled with muscles that are way too weak. Add in the fact that these unique patterns aren’t necessarily symmetrical (i.e. your left quad might be tight when it’s the glute that’s doing all the work on the right) and you have a recipe for pain. If you truly have pain you can’t fix it yourself by the above exercises/stretching you have in the article. You need to see a Chiropractor or licensed Massage Therapist to help manually shift either the lumbar area of the spine or the muscle and fascial tissues in the sciatic area. You are right that the pain is only masked by drugs, not correcting the problem. So do yourself a favor and get it fixed the right way. The exercises here are good AFTER you have the problem correctly fixed. I read the comment of Cat saying she is not allowed to bike.I have a terrible backache with two of my discs dropped and the only thing I do to keep fit is an indoor bike with different programmes,each 30minutes.Am i damaging my back more with this indoor bike?